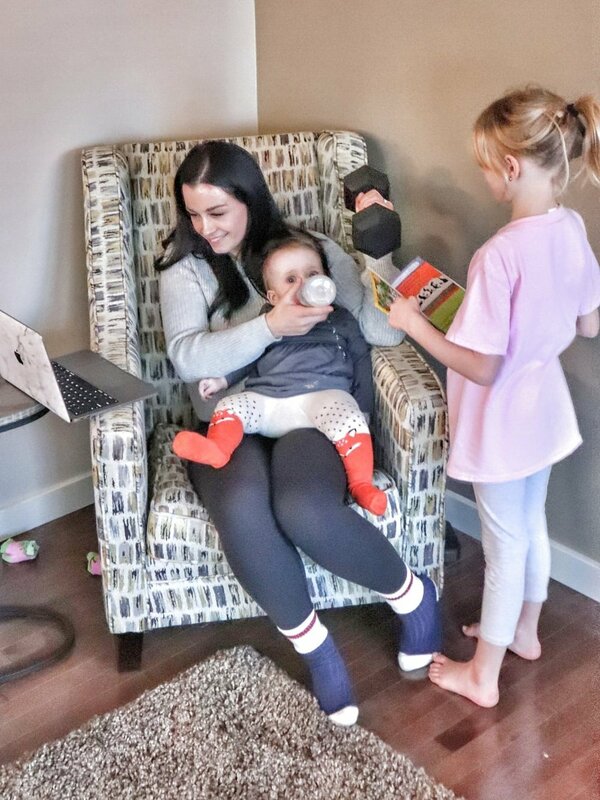 I run a Digital Affiliate Marketing business where I help others learn to run a successful business online through social media, that I get to do from home so I can stay home with my girls and travel full time! Because my girls think they need to be up so early, I have to get up earlier… 6am is a sleep in. I need to get most of my work done before they wake up, or it doesn’t seem to get done. Nap time is where I squeeze in sales calls, video recordings, and host online meetings.. and if I’m lucky I can fold 3 or 4 pieces of laundry from that basket that’s been sitting at the end of the bed for the last week. I read somewhere that multi-tasking is counterproductive, whoever wrote that wasn’t a mother, and certainly wasn’t a mother who ran a business. I was also once told that black leggings weren't the only type of pants in the world.. hmm, who knew? And on other days where the gym is a no go and I just need to unwind, get on the same level as some other mamas, I hit up mom and baby yoga at Lahari Yoga www.lahariyoga.ca/.